If you’re reading this, I hope it’s because you either 1) love to read or 2) are curious about what kinds of books get banned/challenged these days or 3) both of the above. This week, I’ll be writing short posts focusing on various aspects of book bans and challenges, with a featured author daily. 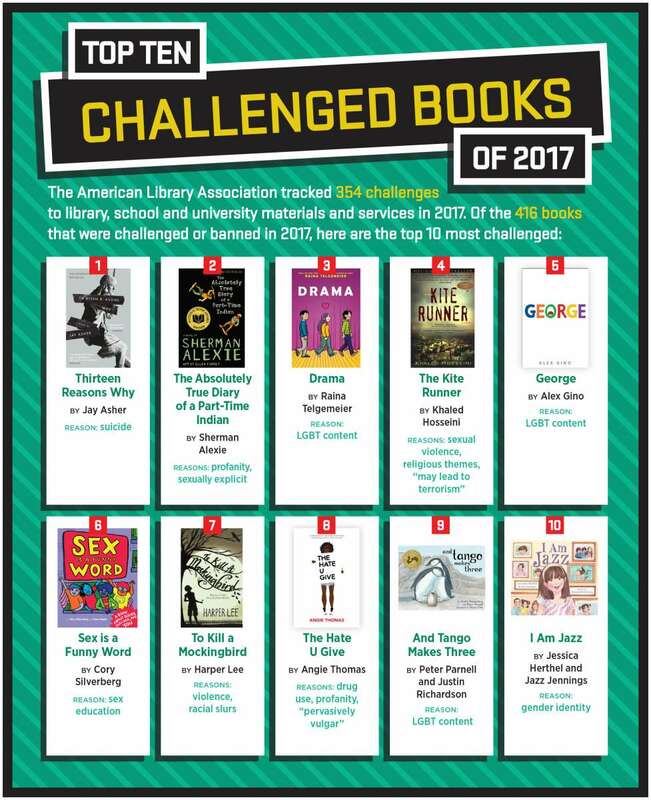 I’ll start the week with an infographic (from the ALA) to give you a sense of the variety of books that get banned or challenged. In 2011 the Kurt Vonnegut Museum/Library gave copies of Slaughterhouse Five to high school students whose Missouri school had banned it. If you’re in Indianapolis during Banned Books Week, check out the KVML’s special exhibit. You can find details here. This entry was posted in Banned/Challenged Books and tagged Kurt Vonnegut. Bookmark the permalink. The subject always makes me recall with amusement how the dimwitted Apartheid regime in South Africa at one stage included Black Beauty in their list of banned books. Ah, yes, and who did they think they were fooling? I bet copies flew off the shelf as readers hoped to find something salacious. I don’t recall much furore over books in the UK since the Lady Chatterley case in the 60s, and occasionally by Mary Whitehouse’s prurient National Viewers’ and Listeners’ Association in the 70s. Challenges and bans are localized in the US — they never make national (or even state-wide) headlines. But this week is a great reminder that censorship is still there.